Yesterday we arrived in Norway. All together. Two humans, two cats, six bags. Somehow we managed to lug everything from customs to the airport train station, from the Nationaltheatret station to the taxi stand, from the taxi up five flights of stairs. 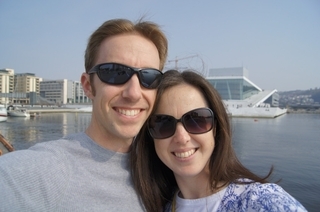 Twenty-four hours of constant motion culminated in the moment Jonathan turned the key in the lock of our new flat in Oslo, pulling the front door open with a theatrical sweep. It's beautiful. Cozy. Light. Charming. Perfect. I giggled and spun as I entered each room, trying to memorize every inch of every wall. Our belongings arrived in early March, and Jonathan has spent the last six weeks setting things up for me. The nest, as it were, has been built, and he did it all exactly right. We reached our flat before 10:00 on Wednesday, so the whole day was ours for the spending. However, this coming weekend is Easter, and Norwegians take their Easter holiday very seriously. Maundy Thursday , the Christian commemoration of the Last Supper, and Good Friday , the Christian commemoration of Christ's crucifixion, are public holidays. The Monday following Easter Sunday is also a public holiday, making the weekend officially five days long! The day we arrived in Oslo was the last working day of the week and many shops were set to close early, and remain closed until next Tuesday. We needed to get out and grab some groceries. Thankfully, there is an excellent market within half a kilometer. That walk, our first together as Norwegian residents, was like a dream to me. Blue sky, fresh air, and quiet, quaint Oscarsgate , our street. The grocery store is extensive and modern, and the food there is, well, expensive! Groceries will be blogged about at a later date, I'm certain. For the time being I'll simply mention that a package of the cheapest possible bacon was 40 kroner, about $7.50. But that's Oslo for you, or so we've heard. Ranked as the second most expensive city in the world (hot on the heels of Tokyo) in 2010 according to ECA International, the average lunch costs $42. Eating out more than once a week probably won't be an option for us! Today we walked all over the downtown, from Aker Brygge (the main wharf) to Akershus Fortress (the city's 13th century castle) to the sleek new Operahuset (completed in 2007) to Det kongelige slot (the Royal Palace), and back home again. Though the full circle tour took only four and a half hours, I encountered WAY too many things to write about. All at once. This city is overwhelmingly awesome, bursting with inspiration. Or else I'm bursting with optimism. Either way, life looks good from where I sit now. Easter is this weekend, and already we've seen evidence of some fun Påske traditions. In a coffee shop, long, leafless birch branches twisted up from the back counter to the ceiling. Suspended from several twigs were wooden eggs, smoothed to a shine. The eggs were delicately painted, yellows and greens, a soft brown feather. A sign on the window read God Påske ! "The crime story genre is a tradition at Easter in Norway. Each year, nearly every TV channel produces a crime miniseries for Easter. 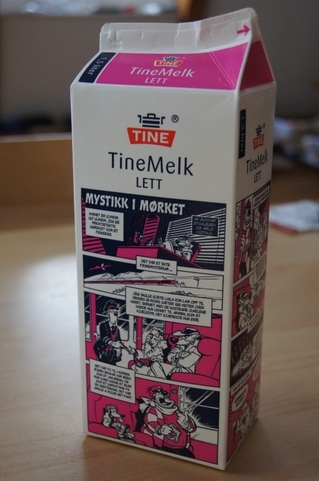 The milk company prints crime stories/brain teasers on their cartons. They are very family friendly with accidental mischief." I read this aloud to Jonathan, remembering that we'd passed a book shop with a colorfully macabre display, bloody lances through pastel hearts, and a sign which read Påske Krim . "We were right," I said. "That sign did say Easter crime!" But he didn't answer. He'd already hopped up from his place at the dining room table. I heard the refrigerator door open, and he returned with our newly purchased milk carton in his hand. Purple and black illustrated panels wrapped around all sides. Mystikk i Mørket . Mystery in the Dark. The hound in the trench coat made us laugh, so I think that means we're assimilating nicely already. If I'm not careful, I'll catch myself writing.